Casseroles are big in the South, so every day at work with our lunch entrees, I make a handful of vegetable dishes and try to include a casserole. Everywhere I’ve worked, I get rave reviews about “vegetable pie” which is my variation on a recipe Frances Moon served at her restaurant in Bluff Park and shared with me. The vegetable part of the pie can vary. Sometimes I use whatever I have on hand but the recipe I’m providing is the way I make this “pie” when I’m starting from scratch. Like most all the dishes I prepare at work, this one is extremely easy but the blending of the flavors and juices into the buttery pie crust is simply delicious and simply Southern. 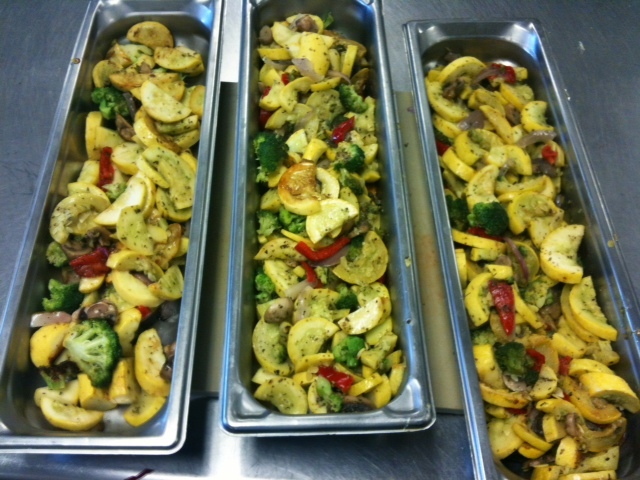 Add olive oil to a large saute pan over medium high heat and saute all fresh vegetables except the tomato slices. Season the sauteed vegetables with the Italian seasoning, garlic salt and pepper. Cook until vegetables are tender and starting to take on a light brown color. Remove from heat and pour into a strainer or colander to allow some of the oil to escape, then pour the vegetables into the pre-baked pie crust. Arrange the sliced tomatoes all over the top of the sauteed vegetables and sprinkle with a little extra sea salt. Combine the mayo and Mozzarella cheese, mixing well, then spread mixture over the top of the pie. This will bake on forming a golden brown “top crust”. Bake casserole at 350 for 20 minutes until top is melted and golden brown. Note: Many times at work I will omit the pie crust and make this as a casserole in a casserole dish. It’s still quite tasty and still loved by my customers, so if you don’t have a pie crust handy or don’t want to run to the store to get one, it’s not a requirement. The best thing about the bottom crust is it absorbs all the extra juices from the vegetables, mayo and cheese and allows you to serve the dish in portions, instead of spoonfuls (like a regular casserole). 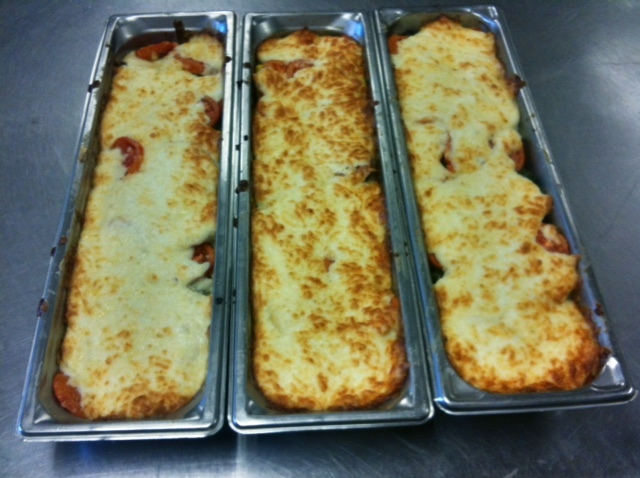 Pictures show 3 casseroles made at work (hence the shotgun pans). Just imagine your finished pie being round, in a nice baked crust with a golden top like the 3rd photo. 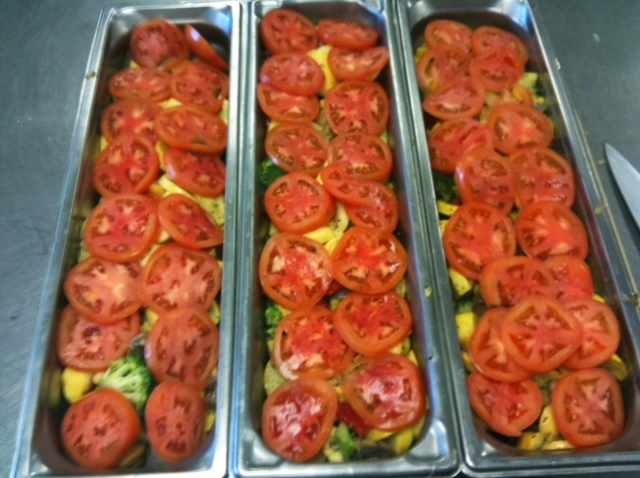 This entry was posted in Vegetable Side and tagged baked tomatoes, mixed vegetables, pie crust by quarlj01. Bookmark the permalink.